RPGs are often considered as a foundation block of the Japanese development industry, with the region's studios still producing a high number of these titles on a yearly basis. Whatever systems you own there are likely to be RPG titles available that were developed in Japan — especially if you have a DS or, increasingly, a 3DS — so it's an intriguing tale that places the origins of the genre in the country at the feet of a Dutchman who would go on to be co-founder of The Tetris Company. Yet that's the case with Henk Rogers. In a fascinating article published on medium.com (originally from issue 26 of The Magazine), Rogers discusses his journey to Japan and the development of The Black Onyx. He observed that he jumped into game development with little experience and unable to speak Japanese, but saw a gap in the market for the NEC-8801 system. ...Next I looked at what kind of games were doing well in Japan. It was immediately obvious to me that the core difference between the two markets was that there were no computer role-playing games in Japan. The US had Ultima and Wizardry. But there were no such adventures in Japan. I thought, I could do that. What follows is a tale of trials and tribulations, with a tight development schedule, limited hardware resources, failed business deals and early struggles in the marketplace. The turnaround came when, running out of money, Rogers introduced the concept to editors of major magazines in Japan; with the subsequent positive review coverage, it would go on to be the top-selling game in Japan for that year while also setting new standards in branding. I sat down with each editor and asked them for their name. I typed this in and then asked them to choose the head that looked most like them. In this way I taught them how to roll a D&D character. Then I left them to play. All computer games at that time were sold for 6,800 yen. I priced The Black Onyx at 7,800 yen and explained to retailers that, with 40 hours of gameplay, the game represented far better value for money than its rivals. More importantly, it also granted a bigger cut for the store. It [a plastic, rather than cardboard, case] made the game appear more valuable. It was something people would keep out, on display; their friends would see the game and ask about it. The Black Onyx would eventually be released as Super Black Onyx on the Famicom (the original NES in Japan), with improved gameplay and new maps, but it didn't take long for Final Fantasy and Dragon Quest to arrive, which took the foundations laid by Rogers' game and improved on them in ways he couldn't. I was flattered on one hand. But I also realized that I didn’t quite understand the Japanese aesthetic and way. These games were quite different to mine, and just struck a more effective cultural chord. Rogers continued to show a good eye for opportunity, however, securing early rights for Tetris on Nintendo hardware and co-founding The Tetris Company. Looking back on The Black Onyx, however, he best typifies how some bold, perhaps reckless, decisions helped him to achieve success and kick-start a genre. If I think back on that journey, thirty years later, it’s like a ludicrous dream. It was the kind of project that’s so unlikely to work you’d only attempt it when you’re young and brave and stupid. I thought Wizardry was popular in Japan at the time. I've heard it cited many times as the inspiration for the early JRPGs like Dragon Quest and FF. Is this wrong? I guess Wizardry may have become popular not until after The Black Onyx. @hiptanaka Well, Black Onyx was based on D&D and Wizardry. They probably cited Wizardry as inspiration since they believed that Black Onyx had the same origin, so they called the root source. So I have this guy to thank for all those great NES, SNES and PS1 RPGs? Thanks for making my childhood, Mr Rogers. @Kaze_Memaryu Yeah, probably. That makes sense. @Jowy Seconded and I like to thank whoever decided to port these risky genre. Dragon Quest creator Yuji Horii's first game was The Portopia Serial Murder Incident (1983). It included a first person maze segment that included a message along the lines of "This is Yuji's attempt at a Wizardry game". That attempt at lead directly to Dragon Quest and it's Ultima style over world and Wizardry style battles. Horii has said on record that he was influenced by Ultima and Wizardry on the Apple II. The article conveniently doesn't mention the release year of 1984. The Apple II was available in Japan starting in the late 70s and it ran PC RPGs in English and Japanese. The Black Onyx may have been one of the first developed-in-Japan RPGs, but to take the next step and say that it was influential on DQ and FF is completely rewriting history. Rogers is completely overstating his own importance possibly due to his own ignorance of the Japan game market. edit: Portopia was Horii's first released game not one of them. @dsparil Ok, thanks. Good to know I wasn't misinformed. His PER, INT and LCK seem to be quite high. Sounds like he deserved to land this critical hit. @dsparil However, he may have locked in the idea of higher prices for RPG games in Japan. Actually, to be a little more generous, he may have still led the way for their popularity and acceptance by approaching the magazine editors directly in the way he did. Though the game ideas themselves may have passed directly from Wizardry and Ultima to DQ, the popularity of the genre could still be due in large part to Rogers. Incidentally, has anyone on here actually played the original Wizardry and Ultima games on Apple ][ (or other early computers). It was an awesome time. 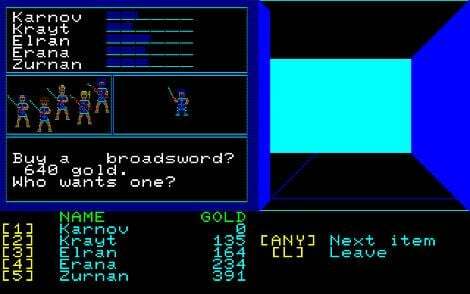 Ultima IV and V were amazing inside the confines of 64KB of memory and incredibly limited graphics power. @aaronsullivan Only the Master System version of Ultima IV. (Which I did loads of stuff / got all the characters and found how to get Nightshade and Mandrake. Improved my reading comprehension significantly though. Tried to draw maps which helped me do most of Phantasy Star not long afterwards). @unrandomsam I didn't even know there was an Ultima IV for Master System. I knew of the NES versions. (looking them up) Oh cool, the Master System version was pretty faithful to the original. That must have been years later than the computer version but that's great.